Since inception, we have had our main focus towards the quality aspect of the offered products and its constant enhancement. We ensure that only premium grade raw material is used to manufacture the offered range of products. After the production process, the manufactured products are properly checked and examined on varied parameters to ensure their adherence with the set industry standards and quality norms. 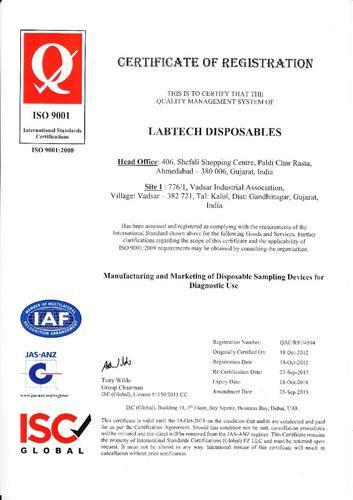 Our constant efforts to enhance the quality standards of the offered products have helped us gain ISO 9001:2008 certification from the government. Being a customer-focused organization, we have always aimed towards fulfilling the varied needs of the clients in the best possible manner. All our products offered are manufactured using quality raw material under the guidance of the qualified professionals following the industry guidelines. Moreover, to understand the exact requirements, our experts maintain a cordial relationship with the clients and stay in regular touch. These professionals also work towards taking the feedback and suggestions from the clients’ regarding the offered products to make necessary changes to the existing product-line for their maximum satisfaction. Further, we ensure that the ordered goods reach the patrons’ doorstep within the postulated time period. OA/QC : We employ a highly trained technical persons and quality controllers, who are familiar with ISO 9001 and CE Quality management system specifications. Quality is controlled from the moment of raw materials arrived and we carefully monitor the entire process. Due to dedication of talented designers and development, research & market personal, we have successfully commercialized a range of innovative customer focused products.